Abstract: The AMD Sempron processor has received little press, but that hasn't stopped it from snagging a large portion of the mainstream market. AMD's previous family of value-oriented processors, the Duron, enjoyed quite a bit of success in its day. It was popular because it was powerful and cheap, and this created a situation where it stole a bit of thunder from the higher end Athlon and AthlonXP processors. AMD eventually phased out the socket A Duron processor, leaving a great wide hole in the bargan basement isle of its product lineup. Enter the Sempron processor. The AMD Sempron processor has received little press, but that hasn't stopped it from snagging a large portion of the mainstream market, first in socket 754 flavours and most recently in socket AM2. The reason for its quick success is largely due to how well the Sempron matches up against Intel's Celeron processor. Well perhaps "matches up" is not the correct word to use, AMD's Sempron processor runs circles around the wheezy little Celeron D! Having a 'value oriented' line of chips that is only separated from the flagship Socket AM2 lineup by clock speed and cache has thus allowed the single core Sempron to sit at the dual core AM2 Athlon64 table without causing too much of a disruption. The key architectures remain identical between Sempron and Athlon64 processor cores, both are compatible with 32/64-bit operating systems, so K8 users have found the prospect of a little less cache an easy pill to swallow when the times call for afford ability. 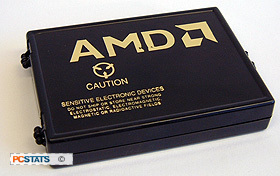 The Socket AM2 AMD Sempron 3600+ is AMD's to top of the line value processor and it has 256KB Cache as opposed to the standard Athlon64 amount of 512KB. With a retail price of just $117 CDN ($105 US, £55GBP), the single core 2.0GHz Sempron 3600+ CPU is certainly easy on the wallet... PCSTATS has already tested the most expensive socket AM2 processors in AMD's stables, but just how will this 940-pin Sempron model stand up to best and brightest AMD and Intel produce? The AMD Sempron 3600+ comes clocked at an even 2.0 GHz, the result of a 200MHz bus speed and 10x multipler (10 x 200MHz = 2000MHz). The 940-pin socket AM2 Sempron 3600+ is utilizes 128KB of L1 cache, and is built with 256KB of L2 cache. That is half the amount of on-core cache memory of the Athlon64, and as we've seen in previous processor reviews L2 cache size will play a key role in overall performance. Cache size is one of the primary reasons the Athlon64 X2 and FX-series are so potent, as each slab of silicon contains 512KB and 1024KB L2 cache respectively. The 940-pin AMD Sempron 3600+ processor is compatible with all Socket AM2 motherboards, and it's internal memory controller supports up to 8GB of DDR2-667 memory (and possibly more as memory density improves). The Sempron 3600+ is x86-64 compatible microprocessor, which in english means it can run native 64-bit applications and operating systems like Microsoft WindowsXP x64 Edition as well as native 32-bit software like Windows XP. PCSTATS has covered the full 32-bit/64-bit capabilities of the AMD K8 architecture in detail in this article, and if you'd like to learn a little more about 32-bit emulation in 64-bit operating systems, this article is very informative. 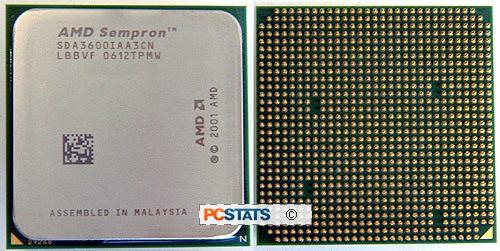 The Sempron 3600+ CPU that PCSTATS is testing in this review is based on the 'LBBVF' stepping and was built in week 12 of 2006. If you're planning on building a budget Sempron computer system it's a good idea to remember that the Sempron 3600+ uses Socket AM2, it is not compatible with Socket 939 or 754 motherboards. I know it sounds like common sense... but what I keep hearing from the techs at Canada Computers is that this is a common misunderstanding. I guess the next obvious one is that DDR and DDR2 RAM is not compatible with one another (for AM2 - it's DDR-2). There are plenty of Socket AM2 compatible chipsets and motherboards on the market, so now has never been a better time to upgrade if that is in the cards for you. PCSTATS has reviewed many AM2 motherboards right here. Thus far all flavors of nVIDIA's nForce 500 series, as well as its GeForce 61xx line and VIA's K8T890 are offering the best bang for your AM2 buck.